I just love the criss cross design of the background and the gorgeous girlie image. I really love this image, and Sanja's perfect CAS style to make it the focus. This little cutie was really eye catching, and so beautifully coloured. A stunning card. Beautifully coloured, and a lovely layout. Now before I move onto our challenge, I have something else to mention, because today is our very own teamie, Samantha's, birthday. I'd like to with her the most happiest of days today, and hope all her wishes come true. Please pop by his shop as he has some amazingly cute images. The prize is 2 digis from his store. your Favourite Sentiment (& why). so my favourite sentiment had to be Christmas related. I love the phrase 'winter wishes' but that didn't seem quite right for this image as it wasn't very 'wintery', so I opted for a simple 'Merry Christmas' instead. I have used the same Birthday Bear from Lee Holland as Annette. and I have to say that I think it fits so many themes too! I've gone for 'Just for You', some sentiments are just not for me, I don't do soppy! Most cards I make are for someone I know so I like to think they see a bit of them and me in them, it makes them special! Using Bear with Balloon from Lee HollandMine is Vladka's sentiment "Live your dreams", it really says everything I believe in life. I don't, apparently, have a favourite sentiment!! 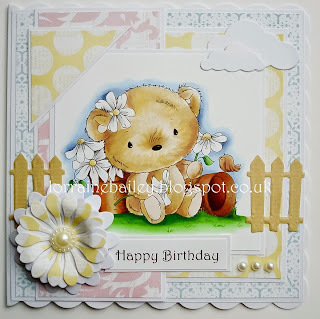 I trawled through my blog looking for a "wordy" repeat and couldn't actually find one, except Happy Birthday and that is rather by necessity!! So here is something a little different, an inspirational phrase rather than a sentiment. Like Sarah I don't think I have a favourite sentiment. Apart from making Christmas cards I make a lot of birthday cards and like to use a "happy birthday" sentiment. 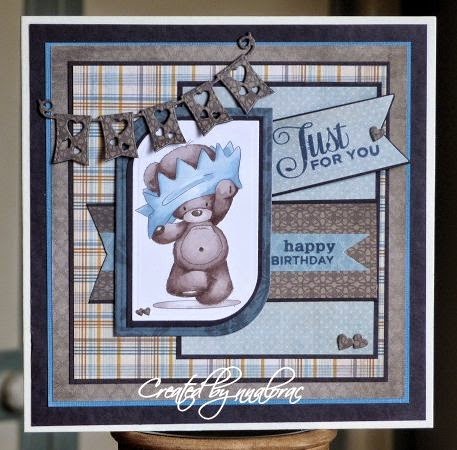 And it fits very well with the birthday bear image. 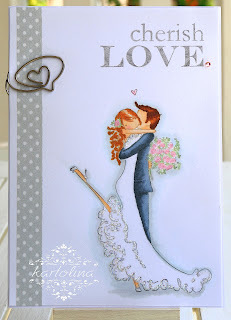 This sentiment is from a stampset of CAS-ual friday, which I like very much. showcase your Favourite Sentiment (& why). Congrats to all of the amazing winners! Wow!! so much talent.. just amazes me!! Love them all!! Love the DT Work too!! 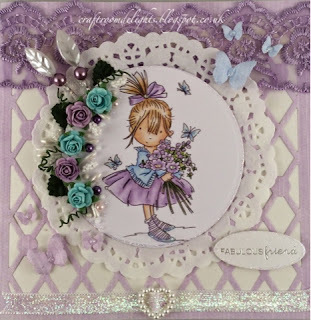 Cute images.. Love Samanthas card with the blues.. Gorgeous creation!! Thanks for another fun challenge! Thanks Susan for the message and also the complements for me too!